There are actually two things that are solely responsible to ensure the survival of an infant inside a mother’s womb, and that is the Placenta and the Umbilical cord. The placenta is an organ (about the size of a normal fist) that links the budding fetus to the uterine wall to facilitate the uptake of nutrients, gas exchange and waste elimination, with the help of the mother’s blood supply. In mammals, the umbilical cord connects the fetus to the placenta. The placenta is a spongy mass of flesh that absorbs oxygen and nutrients from the blood stream of the mother, which are then transferred to the baby via the umbilical cord. The umbilical cord, on the other hand, which is sometimes referred to as the ‘birth cord’, is the set of veins etc. that carries those to the fetus. During labor, the placenta is released from the uterus because of the chemical changes that occur during the delivery, and is removed from the mother by pulling the umbilical cord. One can say that it is where the baby’s food comes from. On the other hand, whenever a baby is born, the umbilical cord is attached at the belly button, and must be cut free. The umbilical cord is a tube attached to both the placenta and the baby’s navel. Your belly button is the remains of your umbilical cord, which would have been severed from your placenta soon after you were born. The placenta and cord is disposed of, and the stump of the cord protruding from your navel shrivels and falls off after a few days, to leave the belly button shape you now have. Life is indeed a wonderful thing, and who would have imagined that these two things, which are merely composed of tiny cells, can bring and support a new life. 1. 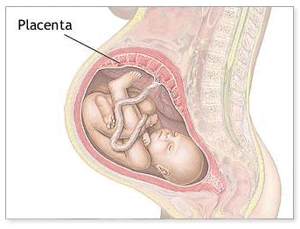 The placenta is where the nutrients for the baby is located, while the umbilical cord just serves as a link between the baby and the placenta. 2. The placenta is discarded after the baby’s delivery, while a portion of the umbilical stump still remains on the baby, but soon withers away as well. Manisha Kumar. "Difference Between Umbilical Cord and Placenta." DifferenceBetween.net. February 11, 2010 < http://www.differencebetween.net/science/health/difference-between-umbilical-cord-and-placenta/ >. Well.I get it now.Though i didn’t understand why the placenta is called the “bond”.